If you are a female skier looking for the perfect ski boot that will give you great comfort, excellent control and help you perform at your very best when you hit the slopes, then you are in luck since you have come to the article that thoroughly reviews the top eight women’s ski boots on the market. Each of the top eight ski boots for women that we shall be reviewing comes with great features that not only enhance the comfort of the female skier but also helps up her game on the slopes. In this post, we shall focus on the main features, the specifications and the pros and cons of each of the boots. Without any further ado, let us now delve into the list of the top ski boots for women. 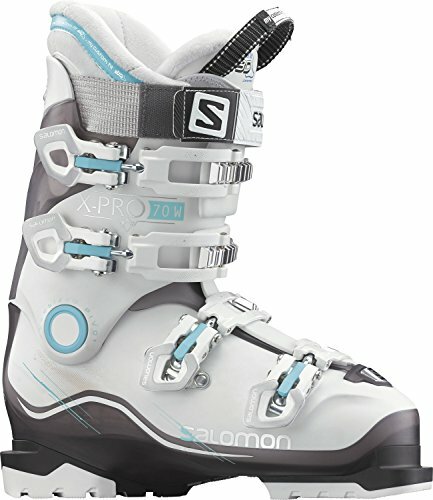 If you are an entry-level or intermediary female skier then the Salomon X Pro 70 Ski Boot for women is definitely worth considering. The X Pro Ski 70 Ski Boot features the revolutionary and extremely comfortable 3D Liner padding that heat-molds to the feet of the skier in order to help them achieve the custom fit that every skier dreams of while at the same time helping to solve the issue of pressure points, thereby greatly enhancing foothold and your experience on the slopes. Another significant feature of these boots is the Twinframe shell construction they come with. This provides a number of benefits to the skier, most notably it provides them with a good flex and rebound to enhance their experience on the slopes. Being designed specifically for women skiers, the X Pro Ski Boot comes with one of the most useful functions in women's boots – a female specific calf adjuster. What this feature does is it allows the boots to be easily adjusted to properly fit the different leg shapes of women in order to ensure that the woman skier wearing the boots enjoys nothing but a comfortable fit. These boots feature a very firm and comfortable closure system using buckles and straps, which work hand-in-hand to ensure that there is powerful and precise grip on the foot to bring about optimal control when skiing. Last but not least, an oversize pivot accompanying these boots joins the upper cuff and lower shell together to conduct energy to the edges of the skis, thereby allowing you to perform better. The boots' Twinframe shell design brings brilliant rebound as well as flex. Boots are very comfortable to wear thanks to a number of features, including the Custom Fit Liner and the comfy fur in the interior of the boots. The oversized pivot of the boots allow for efficient transmission. The boots are supported with a 2-year warranty. It doesn't come with custom moulded shell technology. 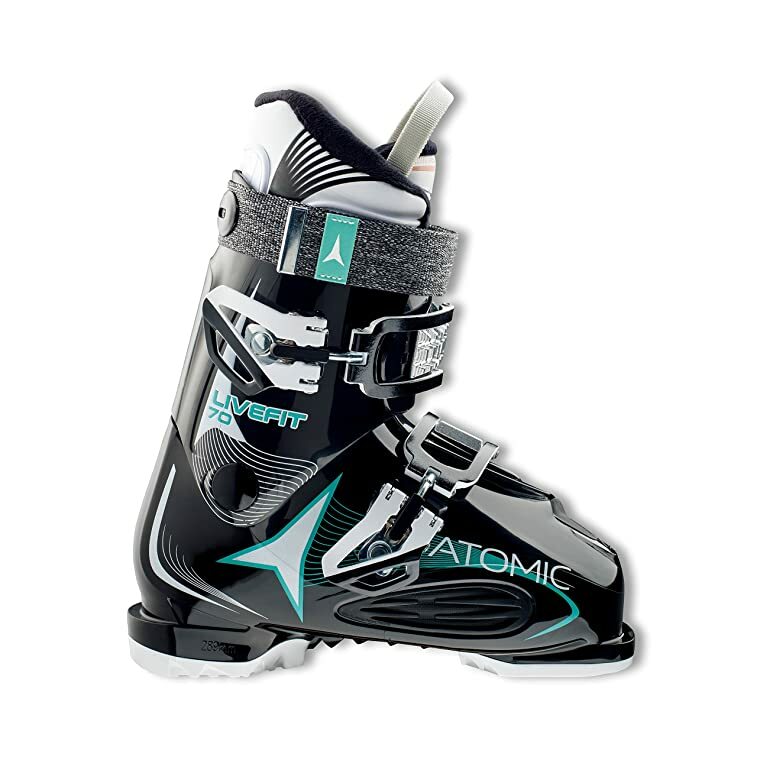 Atomic's Live Fit 70 Ski Boots comes with a fine amalgamation of some of the most useful features needed in a woman's ski boot. Atomic equipped this boot with its Live Fit technology, meaning that it is designed to accommodate the personal contours of your feet, specifically the forefoot. Thus regardless of the shape of your feet, the Live Fit zones located around the forefoot of the boot will automatically adjust to the width of the skier's feet in order to enhance their comfort while at the same time improving blood circulation. In addition to the Live Fit technology, another outstanding feature that enhances the comfort skiers get when wearing these boots is 2 Mega Buckles of the boots. These oversize buckles that are extremely easy to handle perform a number of very useful functions to enhance comfort, most notably providing a very secure foot hold and decreasing pressure points and distributing them over a wider region. Furthermore, these buckles not only contribute to the boots light construction, but also make it easier for the skier to put their feet into the boots. One of the most important features needed to enhance the comfort of a pair of ski boots is insulation to keep the skier's feet warm. Atomic knows the importance of insulation in ski boots, and that's why they engineered these boots with the famous 3M Thinsulate insulation, whose primary function is to keep feet warm regardless of how cold and moist the weather gets. Atomic really went all out to design a boot that in addition to being safe would also offer the skier as much comfort as possible. It is for this reason that the boots come with Atomic's famous Bronze liners that conforms to the foot of the skier. As the Live Fit's flex rating indicates, these boots are good for novice to intermediate skiers. Since these boots are designed with the skier's comfort and performance in mind, they give the skier the maximum fit, performance and comfort. The easy-to-use double mega buckles allow for a secure foot hold. The 3M Thinsulate of the boots keep your feet warm and comfortable regardless of how cold or damp the atmosphere is. Provides skiers with a unique self adapting fit. Atomic boots come with a 2-year warranty. It is devoid of flex adjustment. If you are an advanced or a professional all-mountain skier with a narrow shaft of the leg and narrow feet looking for a high powered ski boot that offers great comfort, then the Lange XT 110 L.V. W Women’s Ski Boots - 23.5 will suit perfectly well for you. 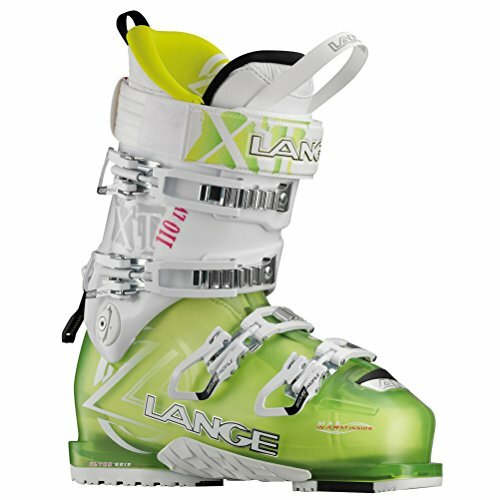 The Lange XT from Lange Boots is a versatile high-performance freeride boot that comes with a number of great features such as a lightweight shell construction and a ski/hike mechanism to ensure the comfort of the skier without compromising downhill performance. The boots have Ultra Grip Soles and Arches that provide the skier with increased traction and grip when the skier finds herself hiking or walking on slippery surfaces such as ice, rock and slopes. The XT 110 L.V. comes with a Power V-Lock Ski/Walk Mode that can easily be switched from ski to hike mode and vice versa. The Power V-Lock Ski/Walk Mode provides the skier with an extremely powerful downhill performance as well as a brilliant range of motion for walking or hiking. 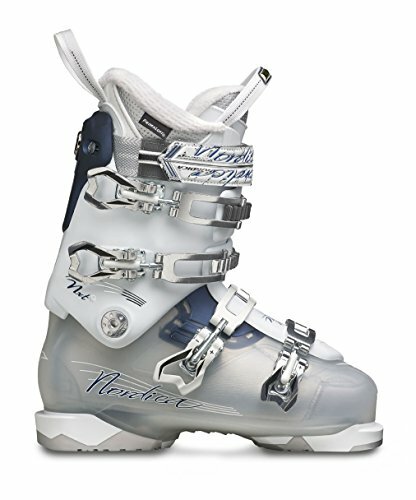 The boot incorporates the famous “CONTROL FIT” liners, which have been designed to provide the skier with excellent fit. The liner, which is Thinsulate® insulated and padded, also provides the skier with a comfortable heel and ankle hold while at the same time keeping the skier’s foot warm in cold temperatures. It is very comfortable to hike or walk in. Can easily be switched from Ski Mode to Walk Mode. Keeps feet warm during very cold temperatures. Comes with no flex adjustment. Has a Flex Index of 110 (Very Stiff). Has a Last Width of 97mm. Comes with a single Cuff Alignment. Comes with a 40mm Velcro Power Strap. The shell material is made of Polyurethane. The bootboard is made of hard polyurethane foam. Suitable for Advanced to professional skiers. It comes with four buckles for an excellent fit. The available sizes are from 220 – 270. The Nordica Cruise 75 Ski Boots from Nordica is the perfect all-mountain ski boot for the intermediate woman skier with a medium to wide shaft of the leg and forefoot. Thanks to awesome features such as a Natural Foot Stance (NFS), a PFP Precision Fit W Liner and an Adjustable Cuff Profile, the Nordica Cruise 75 provides the skier with excellent fit, great comfort and performance. The Nordica Cruise 75 incorporates the renowned Natural Foot Stance (NFS), which plays an instrumental role in enhancing the skier’s performance by not only keeping the skier balanced but also making it easier for the skier to efficiently initiate and release turns, thereby making the skiing experience fun. The boot comes with features such as the comfort fit liner and the adjustable cuff to greatly enhance the comfort of the skier. The liner, with its cushioning foam not only cushions the foot but also helps keep the skier’s toes warm all day regardless of how cold the temperatures becomes. Additionally, the liner easily molds to the form of the skier’s foot and has the ability to absorb impact efficiently. The adjustable cuff, on the other hand, allows the skier to customize the boot in order to make it as comfortable as possible. In addition to the adjustable cuff and the comfort fit liner, the boot also comes with extra padding in the tongue, which gives the skier even more comfort, thereby making it possible to wear the boots all day long without experiencing any discomfort. Keeps feet very secure and comfortable when hitting the mountain. Its wide footbeds, coupled with its extra insulation, helps in keeping the feet warm and comfortable all day. Does not come with a Ski/Hike Mode. 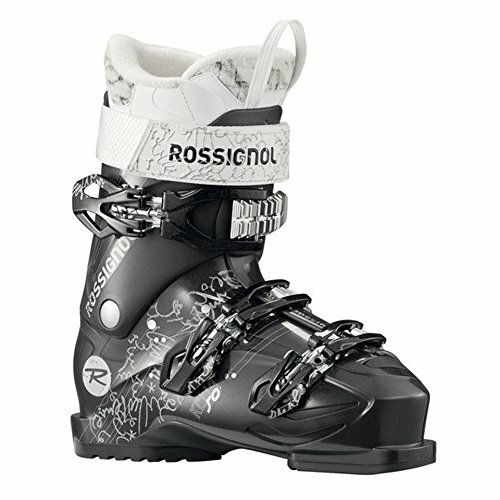 With a flex index rating of 50 and a 104mm last width, the Rossignol Kelia 50 Ski Boots Black Women’s from Rossignol makes a great ski boot for the beginner woman skier that possesses a medium to wide shaft of the leg and forefoot. Its extreme light weight, coupled with great features such as Sensor Fit technology, a contoured forefeet, an asymmetrical toe box, a strong heel cup and a Neutral Stance, the Kelia 50 provides the skier with the utmost comfort. The Kelia 50 is built with Feminine Intuitive Technology (F.I.T. ), which takes care of all a female skier's unique fit needs to ensure comfort and enhance the performance of the skier. The Kelia 50 comes with an XL power-strap and an extra-wide cuff buckle which offers the wearer easy closure while at the same time giving the skier an excellent, solid grip. Keeps the feet secure throughout the day. It is very easy for the foot to be slid in and out of the boot. The Kelia 50 keeps the feet warm and comfortable. Has no flex adjustment and cuff alignment. It also has no Ski/Walk Mode. 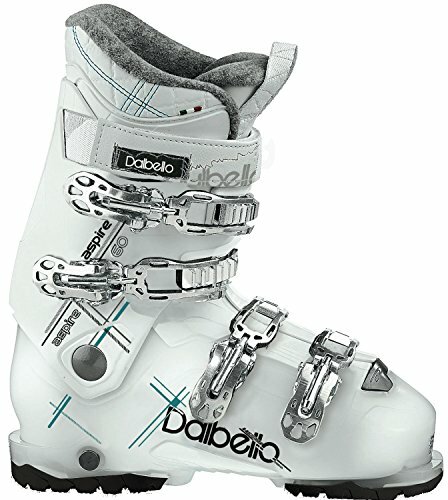 The Women's Dalbello Aspire 65 Ski Boot from Dalbello is one of the most popular recreational women’s ski boots currently available on the market. The boot comes with a flex rating of 55 and a last width of 105mm, thereby making it ideal for a beginner to intermediate female skier who has a medium to large leg shape and feet. With great functionalities such as bi-injected construction, adjustable buckles, low contour profile, Super Comfort Fit System and Dalbello's own Supercomfort Lady Liner, the boot provides the skier with great support, comfort and warmth all day. The Aspire 65 comes with 4 aluminum micro-adjustable buckles that the skier can easily move up and down until it perfectly fits her size. Dalbello designed the Aspire 65 with its renowned Supercomfort Lady Liner that not only provides the skier with excellent cushioning and warmth but also comes with a number of features, including a narrower heel, perfect for the female skier’s foot. In addition to the Supercomfort Lady Liner, the Aspire 65 incorporates a Low Contour Geometry Cuff that has a shape that has the capability of perfectly accommodating the leg shape of the average woman. Thanks to the high tech Bi-Injected Overlap that is located across the boot’s instep, the Aspire 65 is exceptionally easy to wear and take off. The Aspire 65’s last width of 105mm, which is one of the widest a skier can get, is excellent for skiers with wide feet. Provides skier with great support. Keeps the feet warm and comfortable. It is super easy to wear and take off the boots. Comes with an excellent ski/walk mechanism, which makes it very easy to switch from ski mode to walk mode and vice versa. The flex of the boot cannot be adjusted. Does not have cuff alignment. 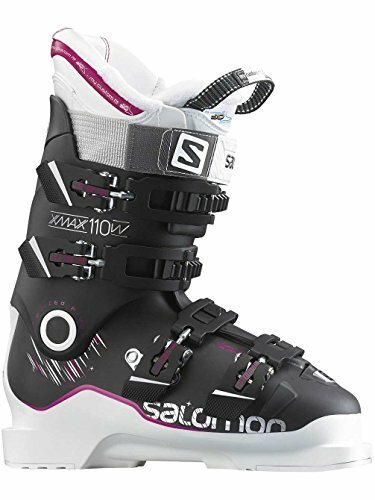 With a flex index of 70 and a last width of 100mm, the Salomon X-Pro 70 W Women's Ski Boots from Salomon, is an excellent choice for beginner to intermediate level women skiers with average width feet who are looking for a comfortable and precision performance all-mountain ski boot. Thanks to great features such as a 24mm Oversized Pivot, a Twinframe Construction and My Custom Fit Sport Liner, the X-Pro 70 W is capable of greatly maximizing the skier’s downhill performance without compromising comfort. The boot incorporates Twinframe Construction technology, which plays an instrumental role in providing the skier with the much needed rigidity or stiffness for greater control, precision and responsiveness. The 24mm Oversized Pivot that the X-Pro 70 W incorporates reduces the interaction between the boot’s lower shell and its upper cuff and transfers power to the edges of the skis in order to achieve outstanding precision and an enhanced performance. 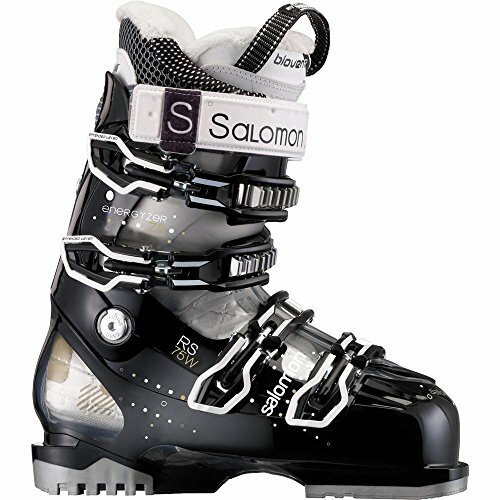 The X-Pro 70 W comes with Salomon’s own My Custom Fit 3D Sport Liner which is thermo-moldable (thermo-formable) by heat to form to the shape of the skier’s foot and speed up the breaking in process. Women's Specific Calf Adjustment, which is widely regarded as one of the best calf adjustments available, has a screw that can conveniently be turned to enlarge the calf area so it can accommodate larger calf and leg sizes. Boot comes with an Articulated Sensifit which allows the skier to easily wear and take off the boot. Does not come with cuff alignment. Cannot be switched to a Walk Mode since it has no Ski/Walk mechanism. 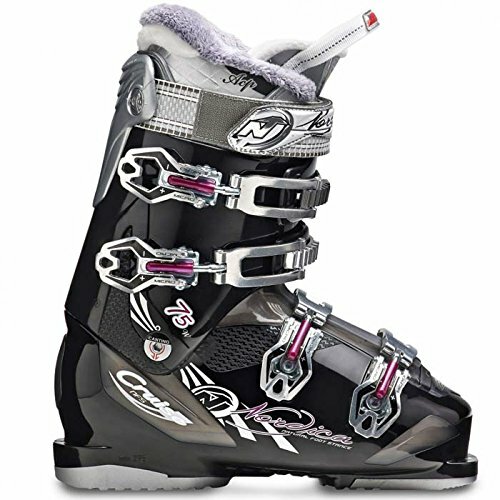 Nordica NXT N3 Ski Boots Smoke Women's is an excellent ski boot from Nordica, an Italian based company renowned for their decades of manufacturing top quality ski boots, skis and accessories for skiing. The NXT N3 comes with a number of great features such as the PFP Comfort Fit, which ensures the feet are kept warm, comfortable and secure whilst the Dual Density PU Soles, the micro-adjustable aluminum buckles and the Adjustable Cuff Profile (ACP) work together to enhance precision and performance. With a last width of 102mm and a flex rating of 90, the NXT N3 is perfect for the intermediate to advanced skier for female skier with a medium sized forefoot and shaft of the leg. PFP Comfort Fit Liner: This insulated liner keeps the feet warm and dry all day. Adjustable Cuff Profile (ACP): Nordica's renowned Adjustable Cuff Profile (ACP) mechanism allows the skier to easily adjust the cuff’s size with an allen wrench in order to match the angle of the leg. This allows the skier to enjoy a comfortable skiing experience. High Traction Dual Density PU Soles: These high traction soles that the NXT N3 comes with greatly aid the skier to walk and hike on slippery surfaces such as rocks and ice without slipping. Provides skier with warmth and comfort all day long. Walking in the boots is easy and comfortable thanks to their high traction Dual Density PU soles. Does not come along with flex adjustment. 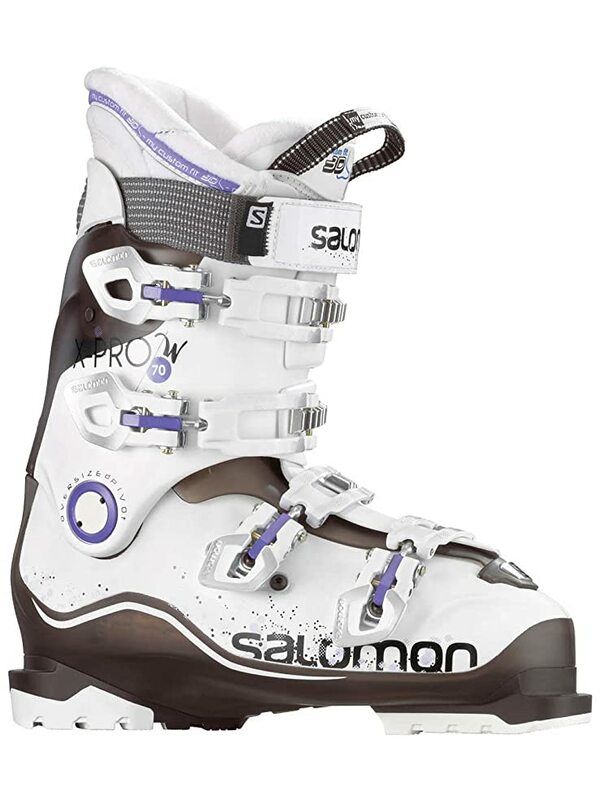 The Salomon RS 75 Women's Ski Boots from Salomon is a powerful high-performing all-mountain boot designed purposely for women’s feet. With a last width of 102mm and a flex rating of 75, the RS 75 is loaded with great features that provide nothing but great precision, performance and comfort to the intermediate skier. Some of the most prominent features that the RS 75 comes with include the My Custom Fit Sport Biovent breathable liner, Women Calves Adjustment, gentle flexing shell and micro-adjustable buckles. All these great features work together harmoniously to give the skier superior control and comfort in order to perform at her very best. The RS 75 comes with one of the most efficient and easy-to-operate calf women’s specific calf adjustment mechanisms on the market. With the turn of a simple screw, the upper cuff can be tweaked to accommodate leg shapes of different sizes and diameters. This breathable and heat-moldable liner is designed to keep the feet warm and dry. The liner’s breathable nature also helps to prevent sweating. The RS 75 incorporates four micro-adjustable buckles that can be conveniently adjusted in order for the skier to enjoy excellent buckle tightness. The boot buckles with great ease. Boot's design allows for easy entry and exit. The boot is highly adjustable. Keeps the feet warm all day long. The Women's Salomon X Max 110 Ski Boot from Salomon is designed for expert women skiers with a medium to narrow leg shape and forefoot. With a flex index of 110 and a last width of 98mm – 105mm, the X Max 110 comes loaded with great features such as micro-adjustable buckles, heat moldable 360 degrees Custom Shell, My Custom Fit Pro Liner and Oversized Pivot which work together to ensure that the skier enjoys a wonderful on snow experience. The X Max 110 has a fully customizable liner which can easily be heat molded to fit the skier's individual needs and allow for a precise fitting ski boot that does not hinder the blood flow, thereby keeping the feet comfortable and warm all day long. In addition to the comfort the X Max 110’s customizable liner gives the skier, the boot’s shell, which is made of heat moldable 360 Custom Shell material, also gives the skier even more comfort since the shell can easily form to the skier’s foot. This not only allows for great comfort, but also allows the skier to ski with more power and control. The X Max comes with 4 micro-adjustable aluminum 3D buckles that can easily be adjusted with a lever in order to achieve a personalized and precise closure. The X Max was designed with a short cuff so that it can properly house women’s calves. Additionally, the boot comes with a cuff-adjustment screw that can easily be adjusted to better accommodate women who have wider lower legs. Thanks to the X Max 110’s 24mm Oversized Pivot, the skier is able to experience great control of the skis during edging. Enhances power and precision during skiing. Ensures a total custom fit, which improves downhill performance. 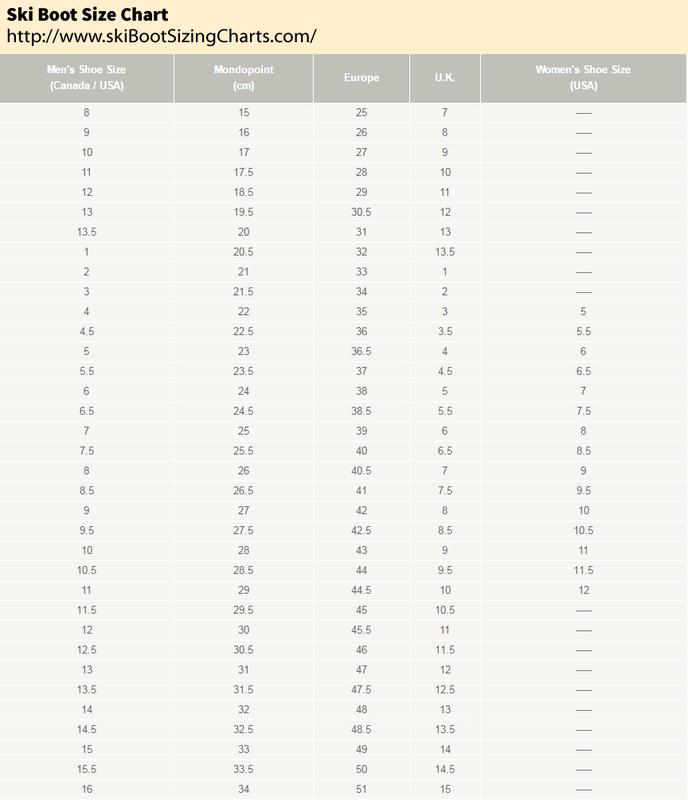 So there you have it, the list of the best ski boots for women currently on the market. Buying a good pair of ski boots can sometimes be quite a daunting process since the market is flooded with numerous brands, each fighting for the attention of the buyer. But we hope with the list above coupled with the rest of the information in this article, would not only guide you to buying the best pair of boots but also contribute to the overall success of your skiing venture. Besides the features of the ski boot, there are many other very important things you must consider before deciding which ski boot to buy. Click here to read a comprehensive list of the absolutely essential ones like what is the flex of a ski boot, how your skiing ability is a major factor in deciding which pair to buy, what is the desired flex, what is "last size", how to measure the size of your foot in order to get the best fitting boots, tips for taking care of your ski boots and many other important information that we cover in our F.A.Q.